A complex, sometimes also referred to as a coordination complex, consists of a central metal atom surrounded by other molecules or ions. These molecules are usually bonded to the central metal atom through dative covalent (co-ordinate) bonds – these are bonds where the shared pair of electrons both come from one atom. This central atom is called the coordination centre. These molecules (or ions) which surround the central metal atom are called ligands. In order to form these dative covalent bonds with the central atom, the ligand must have a lone pair of electrons in the outermost energy level – as such, all ligands are therefore Lewis bases. The number of atoms bonded to the central metal atom is called the coordination number – the most common coordination numbers are 2,4, and 6. It is important to know that the coordination number may not necessarily be the number of ligands (unless it is a monodentate ligand). Additionally, all the ligands do not have to be the same. Ligands can be classified in a number of ways. Monodentate ligands are ones which have only one donor atom (aka they form only one dative covalent bond with the central metal atom). This can also be called unidentate. The image below shows water acting as a monodentate ligand. Ligands of this type usually form octahedral complexes which have a coordination number of 6. Bidentate ligands are ones which form two dative covalent bonds with the central metal atom. They are able to do this because they have two lone pairs of electrons. The image below shows how certain ligands are able to form these bonds. Polydentate ligands are ones which form more than two dative covalent bonds with the central metal atom. This can also be called multidentate. There are certain conventions for naming complex ions which need to be followed carefully. Ligands are written in the order of neutral, negative, then positive. If there is more than one ligand with the same charge, they are written in alphabetical order – prefixes such as di- and tri- are ignored when writing ligands in alphabetical order. Monodentate ligands which occur multiple times are given a prefix according to the number of times they appear (i.e. di-, tri-, tetra- etc.). Polydentate ligands are also given prefixes, but they are bis-, tris-, and so on. Anions are given the ending ‘-ido’ (e.g. sulphate will become sulphato and cyanide will become cyanido). Ligands that are neutral are usually given their normal name – there are some exceptions. These are: ammonia becomes ammine; water becomes aqua; carbon monoxide becomes carbonyl; and nitrogen oxide becomes nitrosyl. If the entire complex is an anion, then the central metal atom’s Latin name will be used, and it will end with ‘ate’. Mercury is the only exception to this rule. If the central metal atom’s oxidation state needs to be stated, then it should be done so as either a Roman numeral or in brackets. So, for example, [Cu(H2O)6]2+ is called hexaaquacopper(II) ion. As a more complicated example, [Cu(NH3)4(H2O)2]2+ would be called tetraamminediaquacopper(II) ion. 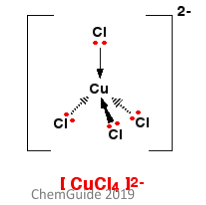 The number of bonds that a central metal atom can form with ligands is dependant upon three things: the size, the charge, and the electronic configuration of both the central metal atom and the ligands. Large central metal atoms with small ligands give rise t high coordination numbers, and vice versa. 6 coordinated complex ions are called such because the central metal atom is bonded to six ligands (in simple cases). These complexes are octahedral in shape. 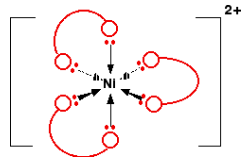 4 coordinated complex ions can take one of two forms. The first is that of a tetrahedral ion, an example of which is shown to the left. The bond angles in this conformation are roughly 109.5°. These conformations can also be chiral, which means the entire molecule is not superimposable on its own mirror image. These complexes can also form a square planar complex. In order to understand the origin of colour in complex ions, you need to understand that transition metals are defined as such because their d orbitals are partly filled. When light passes through a solution containing these ions, a small portion of the energy from this light promotes an electron from the lower ‘set’ to the higher ‘set’. The gap between these two sets will correspond to a certain wavelength of light. So, if for example, the gap between the two sets corresponding to the blue wavelength of light, you would see the complementary colour (which in this case is yellow).